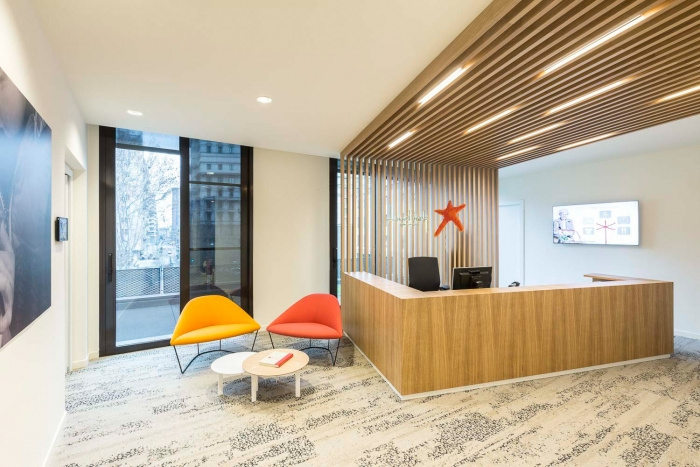 Tétris designed the offices for international pharmaceutical company Lundbeck, located in Milan, Italy. On the first floor, dedicated to clients and guests, we find the reception, the waiting area, a coffee point and several meeting rooms. The ground floor, organized as a big open, has been design thinking to the employees: standard working stations alternate to flexible elements as phone booths, lockers, sofas and poufs. Here our architects have designed an above-ground meeting room featured as a big urban park: a made-to-measure wooden stairs furnished with poufs, grass carpets and suspend lights to recreate the effect of floating clouds. The basement, has been developed to host the break area, becoming occasionally a conference room, a brain storming area and other support space as the server room and the storage room. On both three levels we have installed graphics that revisit the history of Lundbeck and its values, paintings which recall the corporate colors of the brand and finishes that communicate a sense of fresh, light and natural flavor to everyone coming into the offices. In quality of General Contractor, Tétris has also carried out all civil and systems works including the supply of furniture and the move management.